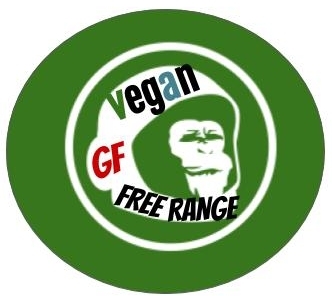 Thats our Vegan logo Monkey, Hector. Hector is the man. He is there to let you know we are #vegan, #glutenfree and of course #freerange! Ive been vegan now for 13+ years and it started not due to any grand ideas of animals being my equivalents or anything so noble. It started because I was essentially lost during my initial phase in Hawaii and looking for an outlet to express myself or perhaps as a way to garner the attentions of more women. Suffice to say, I felt a guitar was in order. I saw an ad at a health food store and drove to the destination, 3 hours drive in fact from Hilo to where I am currently, North Kohala. Upon arrival at the address the transmission seal of my vehicle decided to give out and there was a small tributary of bright red fluid slowly wending its way down the driveway of what I would later, 3 minutes later to be roughly precise, learn was Gentle World, a Vegan Commune. I was told that I could stay with the caveat that I ate what they ate. At first i thought they would hit me with some far out diet, but as it was veggies fruits and grains, I felt reasonably sure of my ability to not die or be too weirded out. That morning I had a Moco Loco* at Kens House of Pancakes and that night I had one of the finest salads I have had to date along with wilted greens and sietan, a meat substitute. *I basically had white rice, eggs, bacon, blood sausage, gravy and a plea from my food processing organs to tread carefully. I stayed for two and a half months while myself and one of the other people in this community fixed my vehicle, which of course meant dropping the ENTIRE TRANSMISSION in order to replace a 7.00 dollar seal. Elon Musk is re-using rocket ships and cars are still being manufactured to squeeze every last dollar out of a consumer. 13 years later I am still vegan as it works very well for me. Lauren has taken to it like a chinchilla to a coat factory, terrible comparison, but as you can see by that horrifically off color comment just now, we are vegans who do not pass judgement. We do not care about what you eat, as long as it is not us. Both of us have more than enough energy, we are not pasty, we work out as regularly as our business will allow and when not working out, we farm, chainsaw, put in 18 hour days and sometimes I personally pull the plow through the fields with my teeth (that is a gross exaggeration/out right lie). We do feel that the world would be better suited if we didn't have the factory farming of meat, but that is a decision we all have to make on our own time and until such a time as it happens, we painstakingly craft #spicyninjasauce for all.